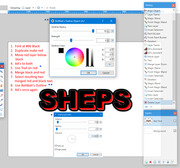 Hi can somebody help me recreate this logo using paint.net but instead I would like it to say SHEPS BIKER BOOKS, If some body could tell me what font this graphic designer used or just give me a few pointers in the right direction ive tried using TR's Monolithic plugin but just cant find the font or get it to like wave if that makes sense. Also, you can use the Shape 3D Plugin to get a 'rounded' curve to your text. As for the Font - I used Arial Black in the above image. Hi @Pixey. I was just about to propose the same . The only thing I can not do is the black outline. The angles are sharp and when I try to use some of the outline techniques or plugins they always end rounded. Do you have any suggestions? I am not that well versed with making text, but did learn once .... can't remember where, to outline the resulting merged 3D text using BoltBait's Outline. These are the steps I used for my result, before using Shape 3D. Paste Warp+ may be useful for modifying the overall shape of each word, as demonstrated in a previous thread. There's currently no plugin that will produce a sharp-cornered outline. The best method I can think of is to produce a rounded outline, then square up the corners by using the Line/Curve tool, followed by the Paint Bucket. There's currently no plugin that will produce a sharp-cornered outline﻿. @BoltBait wrote a plugin some time ago to address this. It works well with right angled objects. Hopefully someone with the ability and time will work on improving it further. You can use this Plugin kill color keeper to remove the black. But, you will be left without a black outline around the text. I suggest, after running the Plugin, to use AA's Assistant, then select the text with the magic wand, at Flood Mode, and then use BolBait's Outline Plugin. After that, use AA's Assistant again.